Electrical substation architecture. It's like learning a new word; suddenly you start hearing it everywhere. "Transformatie Huijse/Transformer House" was unveiled Saturday in Rotterdam. 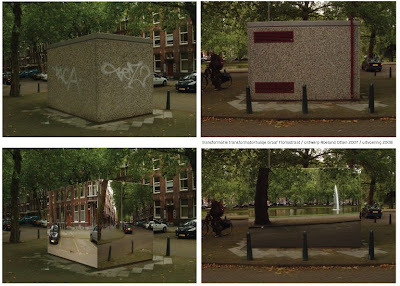 Roeland Otten won a community-run design competition to make the "neighborhood curse"--a giant transformer box installed in 2006 in the middle of a historic plaza--disappear. His solution: wrapping the structure in four trompe l'oeil photos to restore residents' placid views. Sure enough, there's the offending box on Google.